Selous is the largest game reserve in Africa - 4 times the size of the Serengeti. It possesses a diverse landscape, including hot volcanic springs, sporadic lakes, and channels from the Great Ruaha and Rufiji rivers. Walking is permitted (with an armed ranger) which with over 350 species of bird and 2,000 species of plants to see makes this the most heavenly sanctuary to explore. Take a cable car across Stieglers Gorge (100 metres deep and 100 metres wide); bird watching; photography; walking safaris; and fishing Tiger Fish and Vandu (in the rivers of the Kilombero Game Controlled Area to the west of the reserve). 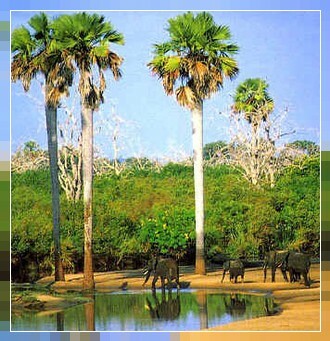 Selous is famous for its elephant, hippopotamus and rhino (although now few remain). The park has a broad range of game: buffalo - the largest population in Africa; Nyasaland gnu; brindled gnu; hartebeest; Greater Kudu; sable antelope; eland; reedbuck; bushbuck; waterbuck; warthog; zebras; giraffe; and wildebeest. Also: lion, leopard, the spotted hyeana and hunting dog are in abundance; cheetah are rare; there are over 350 species of bird and reptiles such as crocodiles and various snakes and lizards.